The 'Arrival' Of The Heptapods: Time Holds The Key To Everything : 13.7: Cosmos And Culture Arrival speaks to all of us, making us think about where we are in life and what we've been doing with the time we have — confronting us at the individual and collective level, says Marcelo Gleiser. 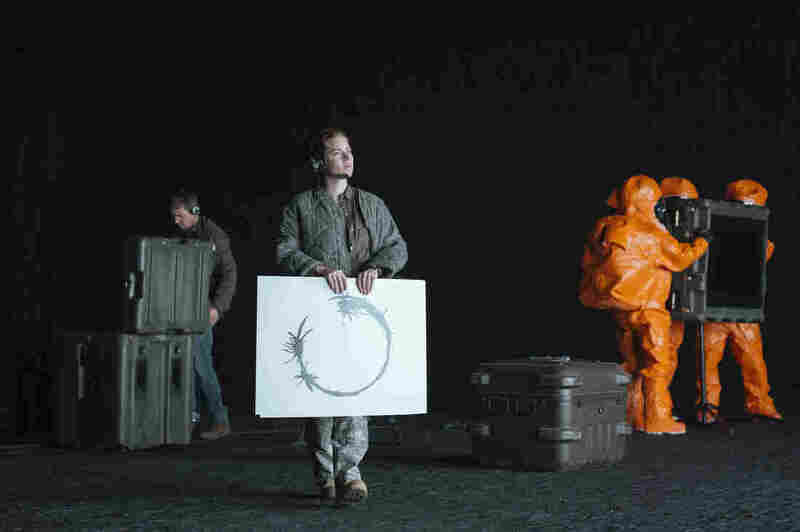 Jeremy Renner as Ian Donnelly and Amy Adams as Louise Banks in the film Arrival. Spoiler alert: This post refers to key elements of the movie. The audience around me was stunned silent at the end of Arrival, the new movie about a visit from advanced extraterrestrial beings based on Ted Chiang's short story. A movie about language, about how to communicate with creatures vastly different from us, left people in the seats speechless. Death, loss, despair, loneliness, perseverance, wisdom, love. Time holds the key to existence. To survival. Contact with an alien intelligence would be, perhaps, the most transformative experience for our species. Especially if the contact were direct, if members of the species were to come all the way here, mysteriously, purpose unknown. To get to our small planet, they would have to have technologies that, to us, would seem like magic — like Arrival's 1,500-foot-high metallic cocoon-shaped monoliths that hover effortlessly in midair, defying gravity and capable (from hints in the plot) of faster-than-light travel. They would be god-like. And, like all gods, they would be adored or feared. An invasion or, better, a visitation from such creatures would thwart the usual fight-or-flight instinct. To fight would be fruitless, although some lesser humans, usually those controlling vast arsenals and with bad judgment, would try. Flight would also be fruitless, since, like gods that control space and time, the visitors would be omnipresent. The only solution is to try to communicate. But how would we "talk" to creatures so different from ourselves? What would their thinking processes be like, their value system? Are the whale-like sounds they make words? Do they have similar semantics rules? To solve the conundrum, expert linguist Louise Banks (played wonderfully by Amy Adams) teams up with theoretical physicist Ian Donnelly (Jeremy Renner) in an unusual — and very welcome — alliance of the sciences, the social sciences and the humanities. Some of the big questions ask that all of our knowledge bases work together, defying the academic walls we erect between the disciplines. Translating an alien language is certainly one of them. "We need them to understand the difference between a weapon and a tool. Language can be messy, and sometimes one can be both," Dr. Banks says to an impatient but willing Army colonel (Forest Whitaker). A hammer can build or destroy; what matters is the intention of who controls it. Meanwhile, as the 12 giant monoliths (in a touching salute to 2001: A Space Odyssey) land along spots near the tropics, the world falls apart. Fear moves people into destructive action; society unravels. Those in power try initially to cooperate in their translation effort. But soon, competition between countries takes over and discoveries become secrets. The Russians and the Chinese stop sharing what they know and arm their weapons around the alien pods. The human tribe splits into national factions; war is around the corner, even if the aliens have issued no threats or threatening behavior. People can't stand not knowing, not being in control. When so much is at stake, silence is a form of torture. But the aliens wait, as if time for them was something different. At some point in the movie, the physicist asks the linguist if she has been dreaming about "them." The movie plays on the "theory" that the brain has a neurological plasticity to reshape itself as one learns a new language, adapting to its quirks and structure. This theory — which is actually more than a theory, according to modern neuroscience — is used in the movie to spectacular dramatic effect. Dr. Banks' brain reshapes itself as she cracks the strange iconographic language of the visiting "Heptapods," whose language is made out of inky, black, loop-shaped blots that resemble Rorschach-test forms. A beautifully evocative sequence of loops reveals itself as a language that mirrors the most god-like power of them all, to "see the future." Loops in time create loops in language. The Heptapods can do this and, in a cinematic dramatization of the challenges of research that every scientist encounters to some degree in her/his career — the battle with the unknown, the difficulty in cracking the mystery — Dr. Banks can do it too. She can see the future. She sees her life with her daughter before it happens, her relationships, her triumphs and her losses. The Heptapods came to give humans gifts, to share their technologies, so that humans, 3,000 years in the future, could return the favor and help them in their time of need. They came to help elevate humans to a higher moral level, a level of cosmic alliance and friendship that makes current bickering and destructive competitive behavior seem ridiculous — red ants endlessly fighting black ants to no real gain. What is needed is what in game theory is called a "more-than-zero sum gain," Banks explains to her teenage daughter: It's when both parties have their needs and desires satisfied. But can humans become seers collectively, rising above their tribal distrust of the "other"? Only if the god-like power is proven to be real. The movie script cleverly mirrors the time-traveling power of the Heptapods, bouncing from present to future to past in narrative loops that resemble the collections of iconic black "words" that float on the misty-white background where the Heptapods hover. The aesthetics inside the cocoon monolith, where humans meet the aliens, is evocative of an altar, a white window not unlike a movie screen where we see the god-like creatures. A movie that addresses time in such powerful ways has a mission. It confronts each one of us with our own mortality, with loss and the brevity of life, the unknowability of our own destiny. No wonder people were stunned into silence at the end. The story speaks to all of us, makes us think about where we are in life, what we've been doing with the time we have. It confronts us at the individual and collective level, as we witness the stupidity of our species, the war games, the fragile state of world peace, so quick to crumble under the smallest of perturbations — let alone one of alien proportions. But herein lies the movie's paradox: The fear is all our own. If anything, the aliens came to share their wisdom, to forge an alliance, to make humans better off. They came because they believe in our species. Too bad that we don't — at least not yet. A previous version of this story incorrectly reversed the roles of actor Jeremy Renner and his character, Ian Donnelly. Previously posted Nov. 23: A previous version of this story said the Heptapods are inky and loop-shaped. Actually it's their language that is inky and loop-shaped. Additionally, heptapods were incorrectly called hectapods in some references.